Most dental abscesses remain localized and pose no serious threat to general health. Still, each year work and school time is lost because of dental abscesses and facial cellulitis, according to the &ldquo;California Dental Association Journal.&rdquo; Although the situation isn&#039;t common, what begins as a toothache and abscessed tooth can turn into a life-threatening form of cellulitis if not treated quickly and properly. Tooth decay, cracks, trauma and repeated dental procedures can lead to irreversible inflammation of the pulp, notes the American Association of Endodontists. Not removing pulp in this condition leads to necrosis. The necrotic pulp tissue will then cause infection or an abscess in the bone surrounding the root. Without treatment, the infection can spread into tissue spaces of the head and neck, becoming cellulitis. The intense hot and cold sensitivity present with irreversible pulp inflammation may dissipate when the tooth abscesses. Painful chewing, localized swelling, tooth mobility, tender lymph nodes and fever may exist with an abscessed tooth. A hard, tender, diffuse and reddened swelling are marks of cellulitis. Fever, swollen and tender lymph nodes in the neck and a general ill feeling commonly accompany cellulitis. The airway may become compromised as the condition worsens, leading to difficult swallowing and breathing. 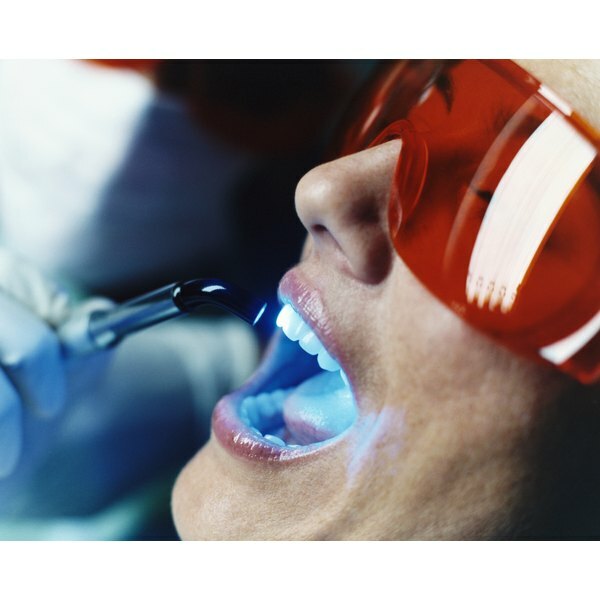 Close visual and digital inspection of the tooth, gum and surrounding tissues help dentists make diagnoses. The dentist will use ice and possibly heat to test the vitality of the pulp. Tapping on the tooth and palpating the adjacent gum tissue also provide helpful information. A dental X-ray can reveal changes in the root surface, the periodontal ligament around the root and surrounding bone tissue. Removing the necrotic pulp is essential when an infected tooth is the source of the abscess and cellulitis. This requires root canal treatment or extraction of the tooth, according to the American Association of Endodontists. An incision and drainage can also help relieve the discomfort of localized swelling. This may also be required with cellulitis. For severe cellulitis, hospitalization for observation and medications may be necessary. Minimizing tooth decay by regular brushing, flossing, professional cleanings and dental checkups can help prevent abscessed teeth. Reporting any changes, such as pain or swelling, to a dentist will help avoid infections that lead to cellulitis.